I’m trying to keep my chin up, but every time I go out to work in the garlic patch I wind up feeling gloomy. It’s the uncertainty of my seed stock and the scare of Phytoplasma infected seed that’s getting me down. One minute I think I was ruthless in my culling. But the next moment I’m questioning if I should be planting any of it. It feels risky, but for now I am forging on and planting the little bit of seed that I think is safe. I plan on making heavy use of floating row covers next spring to keep any potentially infected plants isolated from the leaf hoppers that transmit the bacteria. I’ve been in e-mail contact with a handful of garlic growers and the disease is eerily widespread across the midwest – even as far south as Missouri. Current thinking is that the mild winter coupled with a hot spring and early leaf hopper migration are to blame. The warm spring caused the garlic to sprout earlier than normal. Leaf hoppers don’t actually prefer to feed on garlic foilage, but this year it was one of the few food sources available to them upon their early arrival in the north. It’s easy enough as it is for me to get pretty wound up about our country’s whacky food and agricultural systems and climate-induced outbreaks like this one only compound my fears. But if nothing else, it is a good reminder of how vitally important small backyard gardens are. Diversity, friends! It’s on our side. A wise approach to apply to all aspects of life, really. On that note, if you have a few healthy heads of garlic lolling around your pantry, I beg you to take them out back and plant them. It’s an easy good deed, I promise. And it’s a good investment. Garlic might be in hot demand. Just break apart each head into individual cloves and plunge them into some fluffed up soil – flat (root) end down, pointy tip up, an inch or two deep. Give about 6 to 8 inches of space between each clove. 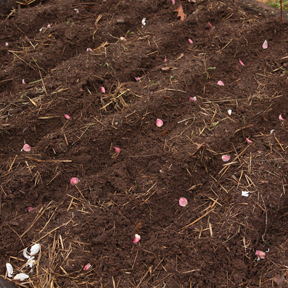 Add a hefty blanket of mulch – straw ideally, leaves in a pinch – and you’re all set, you’ve done your part. Garlic pigs nation wide will thank you. And, if like me, you have any so-so looking garlic sitting about, I have a solution for that as well. We’ll just use that up quick in a garlic infused hot chile paste. 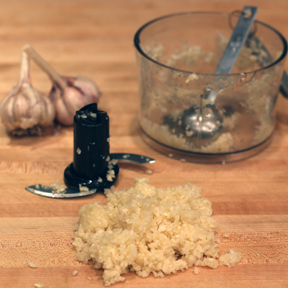 Oh fine, if you insist, you can save out one of your healthy looking heads of garlic to use instead. I’ll just look the other way – this sauce is worth it. It’s so good that it has jockeyed for front position in the condiment door of the fridge – sending the big bottle of Sriracha to the back. In my house, that’s sayin’ something. I was introduced to this knock-out hot sauce a few years ago when my friends Bob and Reba came to dinner bearing a jar of it. It was a perfect condiment for the large platter of Indonesian gado-gado I had made. Fiery, but tangy with just a hint of sweet. Later, Bob assured me it’s the perfect condiment for almost everything. Stir-fries, beans, eggs, even – he claims – peanut butter sandwiches. And he’s right. It’s built on a flavor combination that makes you crave more, in spite of the heat. After I ate through my first jar, Bob and Reba graciously set me up with two more – and the recipe. As it turns out, it’s a recipe from a cookbook that has been sitting on my shelf for years – Sundays at Moosewood Restaurant. The book is a favorite, but it’s thick, and evidently I have not discovered all of it’s gems. I love it when that happens. The book is a collective of 18 different authors, each one focusing on a particular ethnic cuisine. 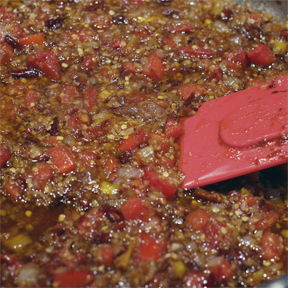 The chile paste – Sambal Bajag – hails from Southeast Asia. In a heavy frying pan or wok, heat the oil and stir-fry the onions and garlic. after a minute or so, add the hot peppers. Reduce heat and stir constantly so they do not burn. As soon as the peppers darken a little, add the remaining ingredients. Simmer the sambal on very low heat until most of the moisture has evaporated and the oil gradually returns to the surface – about 20 minutes. By this point the sauce should be so well cooked that you can’t really detect the tomatoes. Store in refrigerator. Makes about 1/3 cup. Guess we better plant some garlic…..
And update our music – where do I get a drop like that???? Think I’ll make a batch this weekend in between Zombie runs and parades. Sounds like an excellent Zombie project. Have fun! Very sad garlic year for us. We are eating all of our stock, which except for what we got from you a few years back, we had been growing for over 15 years. We got something that Ulf calls pink root. Do you think it is the same disease? We bought some seed from a farm down by Madison. Mullet Creek. Wishing all of us success next year. Good suggestion with the floating row covers.